On World Environmental Day of 2007, Secretary-General of the United Nations Ban Ki Moon envisioned that the United Nations’ headquarters would “eventually become a globally acclaimed model of efficient use of energy and resources.” To achieve this goal, a $2 billion dollar retrofit program is currently in progress, bringing the United Nations’ New York City headquarters into the 21st century. Maximizing the utilization of natural light while maintaining occupants’ exceptional views of the Manhattan skyline and the East River was a top priority. Floor plans were revised to create a full loop corridor around the core to optimizes circulation and maximize the usage of the passive zone. Integral to this is the installation of an automated motorized window covering system for natural light management. By automating motorized blinds and shades, the Secretariat Building optimizes the flow of natural light and heat in accordance with interior and exterior environmental factors and occupant preferences. Motorized window coverings automated with intelligent controls eliminate the drawbacks of fully-glazed facades such as glare and heat gain. Automating motorized blinds with sun sensors maximizes natural light levels ensures high Interior Environmental Quality (IEQ) while automatically eliminating bothersome glare for employees. Intelligent keypads are installed for each window zone. This enables office personnel to manually select from five defined window covering presets according to their personal comfort requirements. However, to balance employee comfort with energy efficiency, the system is programmed to return to the automated sun control mode at predefined times to ensure the most efficient system operation throughout the building. Compared to similar buildings with static solutions such as films, fixed overhangs or manual window coverings, the Secretariat Building needs less artificial lighting, relies less on HVAC and can also implement an energy efficient demand/response program thanks to the installation of automated window coverings. 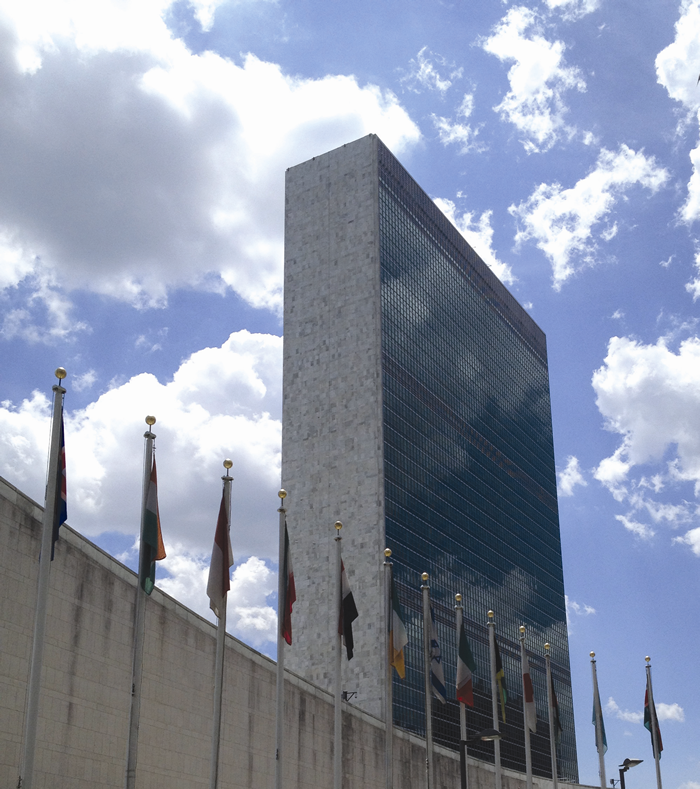 The United Nations Secretariat Building automated window covering solution consists of a Somfy Digital Network system with 5000 blinds and shades powered by Sonesse® 30 RS485 ultra-quiet motors, over 1000 Digital Keypads, and exterior Sunis WireFree RTS Sun Sensors. Blinds fabricated by Mariak were installed by City View Blinds and commissioned by Somfy Systems’ LEED-certified Commercial Specification Team. Since 1969, Somfy has been the global leader in the manufacture of motors and electronic controls for interior and exterior window coverings for both the commercial and residential markets and recently celebrated the production, throughout the world, of 100 million motors. Somfy solutions are scalable, offered in low voltage, line voltage or wirefree options, and are perfect for projects of any size or budget. For more information, please visit www.somfypro.com/commercial-building-solutions or email commercial_solutions_na@somfy.com. Tom Murphy is the general manager of commercial building solutions at Somfy North America, Dayton, N.J.